The chickens have almost shut down in this heat. 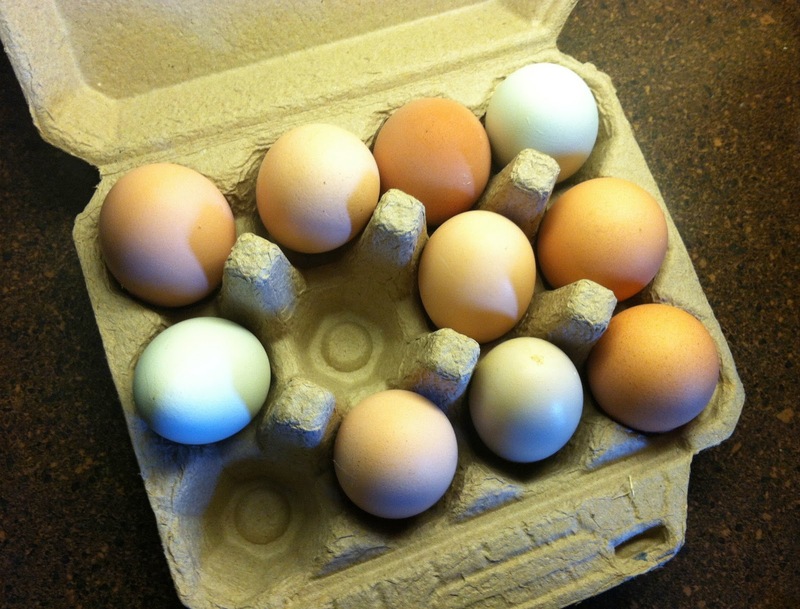 I'm finding less than half a dozen eggs per day in the usual places. This includes the hay troughs and the few hidey-spots that I know about. Either they really have laid off the laying, or there is a growing stash of hard boiled eggs somewhere in an obscure thicket. Either way, eggs are getting harder and harder to come by. Rarer than hens' teeth, as it were. And I'm sad to report that I've lost a couple of chickens whose deaths can only be attributed to the heat. Yes, so far the temperatures have been less extreme than last year, and I'm really grateful, but it's still tough. The hot weather has inspired me to stay indoors more and tackle some things in the house that have been dragging down my energy, attitude, and inspiration. Namely, the incessant and chronic disorder in my living spaces. My husband and daughter traveled to Austin this past weekend to visit friends and see some sights, and so I took advantage of the opportunity to tackle some of the most public areas. I got some peace and quiet, and could focus almost exclusively on each task as it came. For the past several months, the living room and kitchen have been such a pile of unfinished projects and unmade decisions, that I hated to have anyone come in the door. If you've come by for eggs lately and I left you standing on the porch in the heat, I apologize. It's much better now. 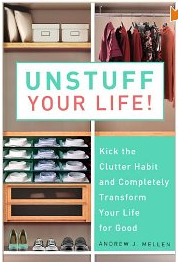 Armed with my new audio book, Unstuff Your Life - Kick the Clutter Habit and Completely Organize Your Life Forever, by Andrew Mellen, I dug in. The title of the book makes a pretty big promise, but I've read enough of this kind of book not to get myself swept up in false hope about the prospect of a once-and-for-all fix. I'm also an organized person, deep down, and I recognize sound organizational principles when I see them. Mostly, I put the recording on just as some kindred-spirit-white-noise while I did what I know to do - organize useful items and pitch the trash. I'm even pretty good at letting go of old stuff, family stuff, sentimental stuff, when I can see that keeping it around just clogs up my life. I do get a great deal of satisfaction out of making Neatness. And what do you know? It's a fantastic book. Better than any other de-cluttering book I've ever glommed on to. Andrew holds to the same two fundamental organizing principles that I do: 1) group like items with like items, and 2) establish one home for every item so that you can always find it. But it's in the details and the fleshed-out systems where Andrew shines. With encouragement and good humor, his book goes through every room in a typical house (including attics, garages, basements, filing cabinets dresser drawers, and even your computer hard drive) and walks step by step through what items should live in each of these spaces. In this way, he keeps your toes to the fire and helps you address one small pocket of chaos at a time, leaving a trail of peace and sanity in its place. If I go back and start at the beginning with this book - chapter by chapter - I'll have a scary-wonderful house when I'm done. But I spent the weekend just getting out from under enough junk to even begin the deep cleaning exercise. Sort of like cleaning before the cleaning lady comes. I totally get that. 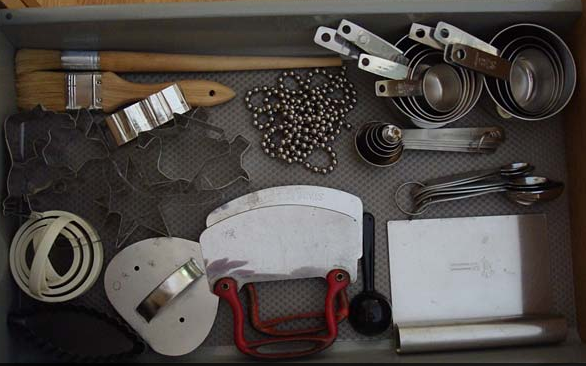 Andrew's baking drawer. Nice. All his drawers look like this. I really believe Mr. Mellen lives this way. Some people might call him a bit over-fastidious or fussy, but they're just jealous. Living this way, neat people save time, money, and mental anguish by being able to put their hands on things they need in an instant. They have healthy relationships with their stuff and only keep what is really, really special (and easily housed) or useful in their lives. They don't buy stuff out of compulsion or obsession, or a need to make themselves feel good. They buy what they need, store it properly, and let it go when it's time. I want to live like that. I really do. 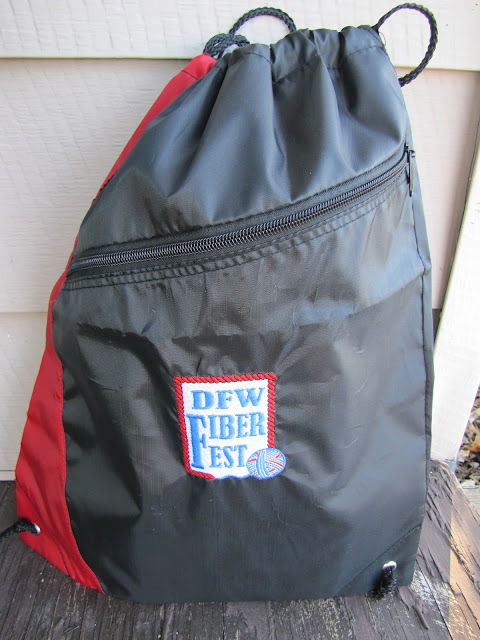 Now, if I can just convince my family that this is a good idea. What spiffy organizing tips help you the most? How neat and organized should we be, on a daily basis? I'm surprised that you're getting any eggs at all! I love cleaning when everyone is gone and I love being organized but have a hard time when no one else likes organization as much as I do. My tip: I keep a basket handy to put everything that doesn't belong in the kitchen and/or living room in. Then as I head to the back of the house at the end of the evening, I drop the items off in their prospective homes. I leave the empty basket next to the bedroom door and return it to the kitchen in the morning. I am the only one who uses this basket method at our house, it seems too complicated to the others. BTW, if you no longer want or need the egg scale feel free to pass it on to another. I should have asked you if you wanted it, I wasn't being considerate. Here I was getting rid of clutter in my house and creating clutter in yours. I love your tip, Judith - thanks! I do similar things, and since my house is so small, I find myself just planning my trips around the rooms like I'd plan my route for running errands... what can I drop off as I head to this room? I think I must walk miles every day, even being strategic. And yes, we always seem to be in a household where the others have very different "stuff quotients" than we do. And I LOVE the egg scale - don't even worry about it! Some things are true treasures! I have read the book, "Unstuff Your Life...". They have a good set of concepts. Decluttering is very important in life. Recently, there's lot of things at home to be stored and no space at all. I moved them to self storage solutions which I feel is very much reliable.